After a short hiatus I am back with some exciting news: I now own a house with a big sunny back yard so my garden will be expanding! Of course I'm excited about the house but I'm also excited about the gardens (yes, plural, front and back) and a potential greenhouse (!!) But let's not get ahead of ourselves. I may be living in a sublet while I work on my house but my plants are still growing, albeit in two different locations, soon to be three. I know...I have a lot of plants. Garden #1 is a very deep raised bed-type area that I've planted plants in and set plants in containers on. It's pretty harsh, condition-wise: it's very sunny and hot and windy and there's no shelter from hard rain. I planted a bunch of tomatoes in the bed because I knew those conditions would dry out pots quickly. Here they are beginning to bloom! 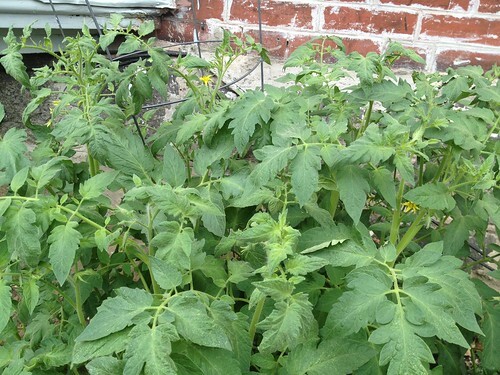 [caption id="" align="alignnone" width="500"] once again I neglected to label all my tomatoes: these are either rutgers or jersey giants[/caption] Notice the unused tomato cage in the back? I have so much room here that I just let the plants spread out. 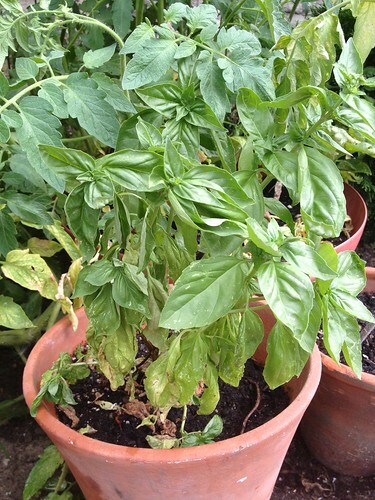 I'll just have to watch once the tomatoes get ripe so that they don't rot on the ground. Or get eaten by wildlife. 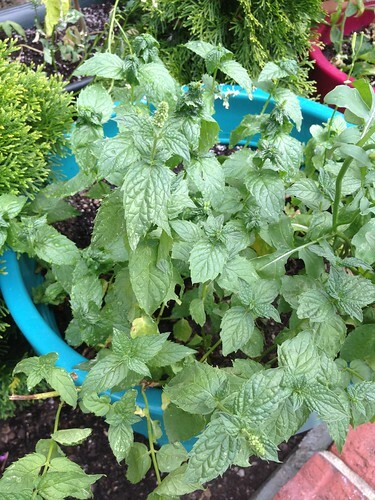 I also brought some mint with me and that is in a large pot in the sunny garden: [caption id="" align="alignnone" width="375"] neglected mint about to flower[/caption] And next to that some basil that is a little dry but still okay, I think: [caption id="" align="alignnone" width="375"] soon to be pesto[/caption] This garden is so big (and I share it with my neighbor so this is just half) that I got a bunch of flower seed very cheap - 12 envelopes for a dollar - and just mixed it all together and sprinkled it around. I actually did have a little bit of a plan: the tallest, poppies and phlox, against the wall, then marigolds, zinnias, nasturtiums and various other "cutting flowers" in the middle and forget-me-nots and sweet alyssum around the border. They're just seedlings now but hopefully I'll have something to show you soon. At Garden #2, which is mostly shade, I have the rest of the tomatoes (in the sunniest spots), peppers, eggplant, figs, ferns, moss, begonias, crown of thorns, bay, chives, thyme, lavender and other things that I can't remember right now. Despite the shade, these guys are all doing pretty well. 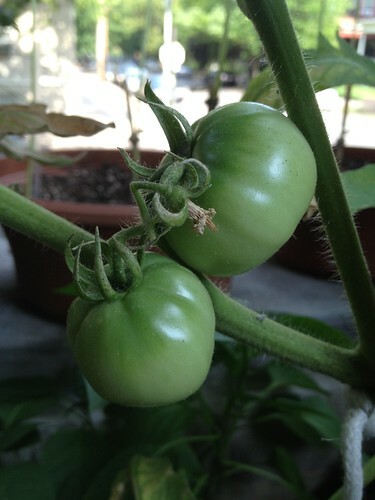 Here are some Dr. Walters ripening: [caption id="" align="alignnone" width="375"] sweeties[/caption] I plan on moving these tomatoes and the peppers and eggplant at least to Garden #3 which is my new house. It's sunny and south-facing and - wonder of wonders - there's a HOSE. My days of filling up watering can after watering can in sinks and bathtubs are numbered, thank goodness.